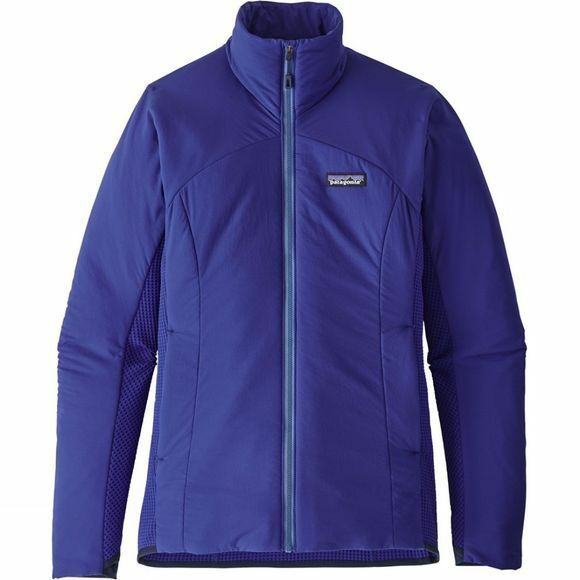 The Women's Nano-Air Light Hybrid Jacket from Patagonia combines the ability to keep heat at your core while being exceptionally breathable, preventing you from over-heating during aerobic workouts in bitter, chilly weather. The lightweight but durable nylon fabric shell and lining sandwiches the FullRange insulation which keeps you toasty without getting clammy, while the air-wicking waffle knit on the of side and back panels quickly combats any excess moisture and heat. Integrated with Polygiene odour control, it stops the growth of odour-causing bacteria on the fabrics without interfering with your skin's natural perspiration or flora. The no-fuss features include a front zip with dedicated low-profile garage, and 2 low bulk zipped hand pockets which wear comfortably under a harness or backpack. The stretch binding hem helps to seal in the warmth, and the stretch-knit cuffs are snag-resistant for comfort and durability, finished with discreet thumb holes for versatile coverage.The highly stretchy fabric, slim fit and articulated pattern a flattering silhouette.